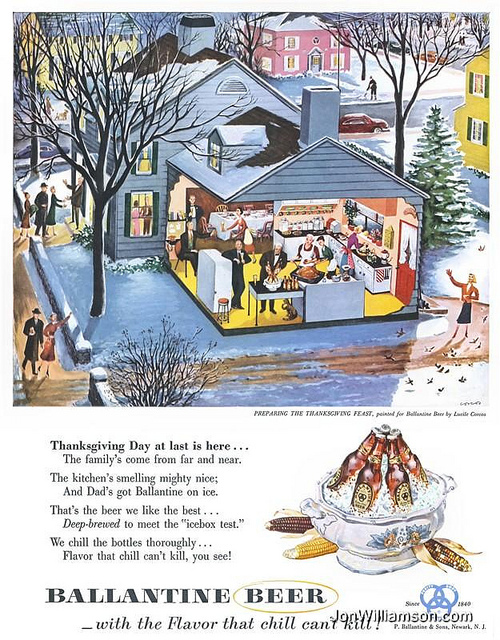 The thankful receiver bears a plentiful harvest…..
After World War II, Van Munching, the US importer for Heineken, used wine and spirit houses for their distributor of choice. Since imports were not very big at the time, this strategy of using wine and spirits houses made sense. The model worked because beer was sold mostly through package stores. Coupled with the fact that Heineken was sold primarily in restaurants and bars where liquor and wine were also available, made for successful distribution. As other importers came into the US, they too started following Heineken’s business model and appointed the wine and spirit houses as their distributors. In almost every case, the wine and spirit house operated on a statewide basis, making pricing and logistics easy for the vendor. In some cases, the vendor only had one call point and from that call handled all distributor communications. Many imports preferred this model. Then came craft beers, and most saw the wine and spirit model as the best distribution option for them. In fact, throughout the 90s New Belgium employed the wine and spirit model. Glazer’s was awarded New Belgium in Texas, Arkansas and Kansas. RNDC had New Belgium for all of Arizona. In 2005, Glazer’s, counting the Chicago JV with Union, represented 22% of Warsteiner’s total US business. Oddly, the commitment to beer varied from state to state by the same wine and spirit company. For example, RNDC had beer in Arizona and Florida, but no beer brands in Texas. Southern Wine and Spirits was strong in some states, like Nevada and South Carolina, but not in California. Once Heineken created its own importing company, they started to systematically change from wine and spirit houses to beer distributors. The rapid growth of Corona forced Heineken into the beer distributor house because getting the distribution they wanted was only possible through the beer distributors. While at Gambrinus in the late 90s, I received a call from the largest c-store chain in El Paso. They had 34 stores and the buyer was upset because he could not get Corona from Glazer’s. I made all 34 stores with the Glazer’s branch manager and found almost no Corona in any stores. 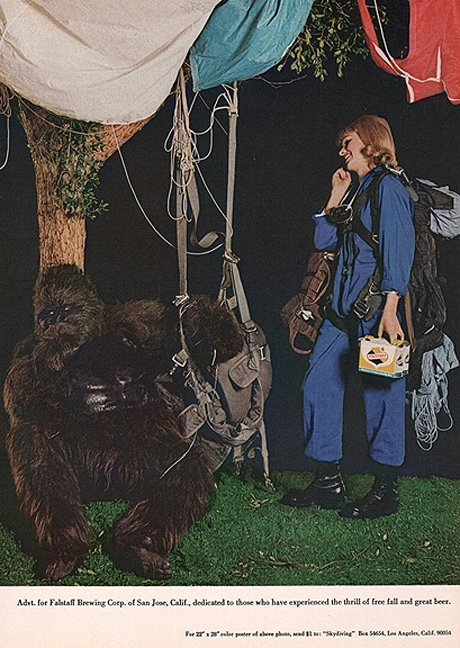 Glazer’s did not have the Gallo brands in that market; therefore they did not service the c-stores on a regular basis. When they did, there was no merchandising or rotating. Needless to say, after an intense meeting with Glazer’s management, 10 beer salesmen were hired and sales doubled. As the consumer began to discover the craft beers, these craft breweries realized that getting their products to the shelf and expanding distribution was necessary for their continued growth. In many cases, the wine and spirit houses either would not, or were unwilling to build the infrastructure needed to service the retail market to the same quality level as the beer distributors. Over time and out of necessity, the craft breweries began leaving the wine and spirit houses for beer houses. Most of these departures were amicable, but in some cases, the courts became involved. Even today, these departures continue. Wine and spirit houses are led by wine and spirit professionals while beer houses are run by beer people. By the end of 2015, the craft beer industry should be 10% of the US total domestic beer volume. The question is, if the crafts’ continued growth reaches a market share of 35%+ in the US, then this Thanksgiving the beer distributors should have much for which to be thankful. The MC and ABI distributors should thank Southern, RNDC, Glazer’s, Charmer, and others W&S companies for not investing and building the infrastructure needed to grow crafts and imports. They should hope that the CEOs of these companies continue to ignore this opportunity. This Thanksgiving, the beer distributors are the thankful receivers that will bear a fruitful harvest! The risk of doing nothing is the greatest risk of all…. My first four and a half years in the beer business were spent on delivery trucks, first as a helper, then as a salesman, and finally as a route supervisor. Remember, during this time beer was sold DSD and both the salesmen and helpers were paid with a base and commission established on what they sold. Commission rates varied from three cents with Coors, to 10 cents with Falstaff. We all loved those hundred case drops. Since these were commission based sales jobs, the driver’s biggest concerns ranged from losing accounts to the company adding new routes. Most distributors had only one or two brands, and when one brand started to grow, distributors started looking into adding additional routes. Once that decision was made, the distributor took accounts from other routes to make up the new route. No sales person ever wanted to lose accounts, especially good ones, but every single time that I saw a route added, sales trends increased over the old trends. Even the salesmen who lost accounts saw their overall sales increase as they were able to focus more on their existing accounts. Likewise, when a distributor who had a brand that was declining cut a route, the opposite happened. At first it would take a while, but soon, the decline of the brand accelerated and sometimes the decline off-sets the expenses gained as a result of the lay-off. No one won in that case. Breweries, not unlike distributors, go through periods of down turns and pear back with cuts and lay-offs. The personification of this type of business action, with the exception of going out of business, was when InBev took over AB and the resulting thousands of employees who either retired or were laid off. Recently, MillerCoors announced that they would begin lay-offs affecting about 200 sales and marketing people. In addition, numerous production workers would be also losing their positions at the same time. Since 2008, both ABI and MC have lost millions of barrels in sales. Some of that lost volume is attributed to the recession and tax increases, however, the question should be, how much of that lost volume comes from the reduction in talent? Those employees who lost their positions were highly trained and educated. In the case of ABI, many of those who left were long time employees with over 20 years with the brewery. While cutting out these salaries and expenses may look good on the company’s income statement, there will be, and is, a negative effect to sales. No company can lose that type of experience and not have its overall performance negatively affected. So the question is what is happening to all this available beer talent? Many of these highly experienced beer people are finding new careers in crafts and small importers. Once a craft brewery is established, there becomes a time when it must get to the next level in its life cycle. The brewery needs experienced beer talent and thanks to both MC and ABI, the talent is available. The challenge for the crafts is just how to maintain its culture, yet be able to grow and obtain the talent it needs. Established breweries such as Sierra Nevada and New Belgium have learned to do this, others such as Founders are just figuring it out. Those professionals from ABI and MC who are joining these companies bring experience and valuable relationship skills to the craft culture and the industry is seeing the results. 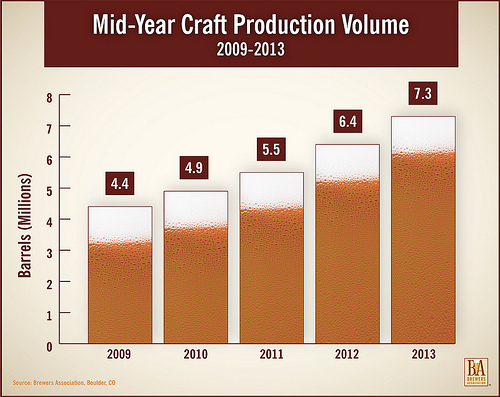 Craft volumes are flying. The craft industry should thank MC and ABI, as those two breweries must believe that the risk of doing nothing is the greatest risk of all! In the early 1990s, Warsteiner’s President, Diane Fall, asked me to help them find and implement a new accounting system at Warsteiner’s Denver headquarters. While in Denver on this assignment, Diane knowing that I had just recently left Coast Distributors in Oregon asked me if I would open a distributorship in San Diego. Warsteiner did not have any distribution in southern California at that time and needed someone to get Warsteiner on the shelves. I looked into this opportunity, but even though Warsteiner would have gotten good distribution in the market, it would have been difficult to be successful with just Warsteiner. I knew that the worker’s compensation costs alone would kill the company given that the west coast states, California, Oregon and Washington, had very high workers comp. rates. While I was tempted to jump in, it was really easy to walk away from this offer just on the insurance rates alone. While there is much to discuss in today’s beer business regarding distributors and the crafts complaint to access-to-market, several key points are clear. If there was access to a major distribution system, why would a craft brewer attempt to self-distribute? Aside from focus on their brands, the cost of self-distributing when a system is available should not even be a consideration. In Florida, the ABI and MC systems have informed the 50+ craft brewers in their state that their distribution system is available for each company to access in lieu of self-distribution. They are providing the craft brewers with the option to choose between these systems, which are, by far, the two best and most effective way to market. Another key point, and perhaps the most important one, is that if the crafts use the ABI and MC systems, said crafts will then be ensured of no illegal market practices and their brands will be offered on a level playing field. In just the last years, Illinois and Arizona have both investigated illegal activity in the beer industry. In both cases, pay to play was abused. A brewer, supplier, importer, or distributor, if caught and found guilty, could be fined and or have their license to sell beer suspended or even revoked. After investing hundreds of thousands of dollars in building a brewery, would a craft brewer risk this type of illegal activity? The three tier system is by far the most effective and efficient way to get beer to the market. Distributors have invested and built systems which can get beer to the market cheaper than what any other system offers, providing a means to merchandise, rotate, manage retailer inventory, price, and promote their beer. One can argue that it was not that long ago that MC and ABI distributors either were not set up to effectively sell crafts, nor had the skill set to do so. However, both MC and ABI distributors have invested heavily against crafts and can now help all these craft brewers. So the question is, if your business card says brewer, then why be a distributor when there are better options? If you do not know where you are going, then you might end up some place else! In my efforts to build the beer portfolio for Glazer’s, during my time there as the Corporate Director of Malts, I contacted Dogfish Head in Delaware. As this was over 10 years ago, Dogfish had not achieved the status it now holds in the craft world. I flew to the brewery and met with Sam Calagione who was a great host. We visited the restaurant and toured his small brewery. By the time I left, we both agreed that Glazer’s would distribute his products in Texas, rolling them out in the first quarter of the following year. That agreement was confirmed at the NBWA later that year when Sam and I met with the Texas Glazer’s beer team. That fall, Dogfish began asking for volume commitments and minimum orders. A minimum commitment is difficult for any distributor, especially if a brand has limited consumer awareness, which was the case for Dogfish in Texas at that time. By the first of the year, communication between Glazer’s and Dogfish had disappeared so I contacted Sam only to learn that Dogfish had instead appointed CR Goodman distributor for the state. Goodman had committed to the brewery’s request of minimum orders. Needless to say I was disappointed on how this was handled. New Belgium’s recent appointment of an Ohio distributor, and the fact that the distributor agreed to pay NB 3X, or $18 a case, to distribute the brand, has changed how the industry works. Industry observers have weighed in on just how NB’s actions will affect the industry going forward, but regardless, distributors have to be concerned. The beer industry in the US is contracting; there are some who say that the overall industry volume will be below 200 million barrels in the next year or so. Premiums, sub-premiums, and lights are declining, some at an alarming rate. Imports overall are flat as a category. Crafts, as we all know, are on fire. The craft category is over 7% of the total market and growing. There are thousands of craft breweries and currently one new craft brewery opens every day. Going forward, just how large will the craft industry grow? Much has been written about attempts by the craft brewers to change or modify state beer statutes. Craft brewers will become stronger and more influential as the category grows and laws will change. But until that happens crafts will look to ways to manage the franchise protection that distributors currently enjoy. If trends continue, crafts could become 40% of the industry volume and over 50% of the dollar volume. Of course, it will be fragmented between many suppliers, not the oligopoly we currently have with domestics. To grow and survive, will distributors with franchise protection wave their state franchise rights to forgo upfront payments for brands and sign performance and time bound agreements? Such a movement will resemble spirit contracts. The distributor gets the brands for free and makes money off the brands, while the vendor can measure performance against agreed upon goals. The contract ends and either it is renewed or the brand moves. If the brand moves, and it has some volume, more than likely another brewer will leave the acquiring distributor and move to the losing distributor, as is the case for wine and spirits. Brown Foreman and Diageo are always in competing operations. This pattern is already beginning in the craft world. Founders and Bell’s compete against each other and avoid the same warehouse. This will happen more often in the coming years especially if more distributors open up and specialize in crafts/imports. There is a paradigm happening in the beer industry at the middle tier and unless distributors work with brewers on these major issues, crafts will find another way to achieve their goals. For distributors, if you see a bandwagon, it’s too late!